SYDNEY — The family of an Australian woman who was fatally shot by a Minnesota police officer in July demanded a more rigorous probe Thursday after a prosecutor cast doubts on the investigation. Hennepin County Attorney Mike Freeman faulted investigators last week when he complained that he doesn't have enough evidence to charge Officer Mohamed Noor in the killing of Justine Ruszczyk Damond. Noor shot Damond in the alley behind her home after she called 911 to report a possible sexual assault. Freeman was captured on video at a Dec. 14 holiday reception expressing his frustration about the case. He said it wasn't his fault that there was not enough evidence to charge Noor, and that investigators "haven't done their job." Noor has declined to speak with investigators. Freeman didn't name the investigators, but the state Bureau of Criminal Apprehension is leading the investigation. He has since said he didn't know he was being filmed and apologized for discussing the agency's work in a public setting. Noor fired at Damond from the passenger seat of a squad car, across his partner and through the driver's window. Damond's death sparked protests and led to a police department shake-up, including the resignation of Chief Janee Harteau. Flanked by three other family members, and pausing occasionally to compose himself, Ruszczyk said that after the shooting, authorities in Minneapolis had "looked me in the eye and said they were committed to getting to the truth of the event". "Now I hear that the Hennepin county attorney, to whom the BCA handed its investigative results, says that the investigation has not been done to the prosecutor's satisfaction, or even to the expected levels of accuracy and thoroughness," Ruszczyk said. Ruszczyk cited a quote by American writer James Baldwin: "It is certain in any case that ignorance allied with power is the most ferocious enemy justice can have." Ruszczyk said this was particularly true "when it comes to evaluating the use of deadly force by those sworn to protect us." He added: "Ignorance cannot prevail here." Mayor and police determine shrine for victim must be removed.. 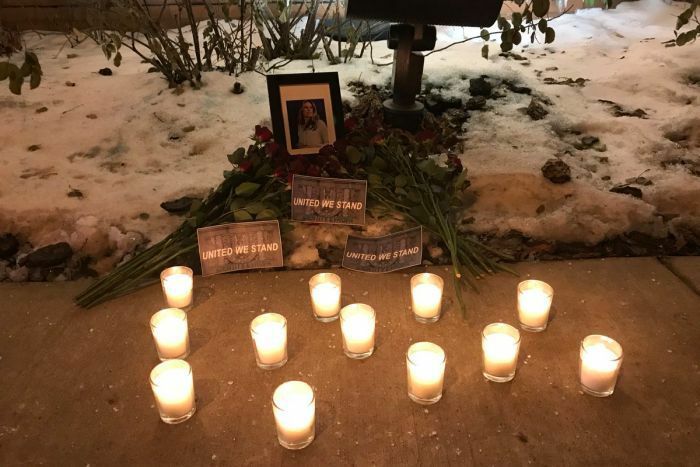 The incoming mayor of the US city of Minneapolis has condemned a white nationalist group, which set up a shrine to Australian woman Justine Damond who was shot and killed by a police officer. The white nationalist group Identity Evropa set up the shrine last Friday. On Twitter, the group said they created the shrine after prosecutors did not charge the officer involved. It was condemned by police and local mayor-elect Jacob Frey, and has now been removed. Grand jury called.. still no word on charges..
Noor hasn't been charged, but Hennepin County Attorney Mike Freeman said weeks ago more investigating was needed in the case. He also told activists in a recorded conversation he didn't have enough evidence and investigators "haven't done their job." They'll protect Noor until they just can't protect him anymore. ^^^ I see what you did there! Javelin Man wrote: ^^^ I see what you did there!